This half day instructor led classroom training is most popular and best training option. Classroom training is followed by a proctored exam. Certificates are provided instantly after the exam. Classroom training is available every Monday in Boston and every Tuesday and Thursday in Woburn. Please select location and class date below then click on “BOOK NOW” button to continue. Grayed-out dates indicates holiday or sold out for the day. Note: In order to take online exam you will have to come to our Boston or Woburn, MA office as selected below. 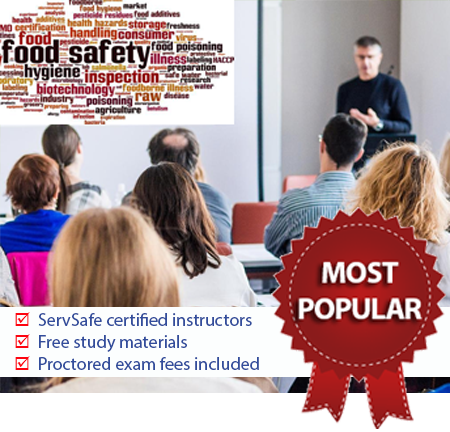 A Proctor is required for all ServSafe Food Protection Manager online exams. ServSafe certified instructor led classroom training. Package also includes free study guide (PDF file) and access to practice exams. Every Monday in Boston from 3:00 PM to 8:00 PM at 265 Franklin st, Suite 1702, Boston, MA 02110. Every Tuesday & Thursday in Woburn from 10:00 AM to 3:00 PM at 600 West Cummings Park, Suite 1700, Woburn, MA 01801. Included in the price. You will receive access to PDF study guide and practice test via email after registration. Online or Written. With online exam you receive results and certificate instantly.